ISU coach Paul RhoadsIowa State opened the college football season with a 34-17 win over North Dakota State in Ames Thursday night. The Cyclones went 81 yards in nine plays and scored a touchdown on the opening drive of the game, but seemed to struggle at times on offense and defense. It was a return to Iowa State for Rhoads and his first win as a head coach. 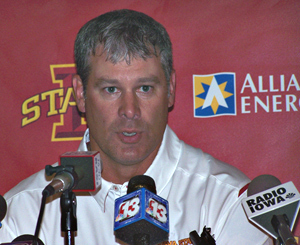 “It’s special to win a football game as a head coach and to do it here, yeah, it was a fun night,” Rhoads said.